FILE - Pakistani Prime Minister Nawaz Sharif, center right, greets Afghan President Ashraf Ghani, center left, upon his arrival at Nur Khan airbase in Rawalpindi, Pakistan, Dec. 9, 2015. Pakistan has “greater control” over the Taliban than the Afghan government “initially thought,” but contrary to its public assurances, Islamabad has never intended to bring the insurgency to peace talks with Kabul, allege senior Afghan officials. “In fact Pakistan’s old policy vis-a-vis Afghanistan that was claimed to be abandoned in fact has not been,” a close aide to Afghan President Ashraf Ghani told VOA. He requested anonymity. Afghans have long accused the Pakistani military-intelligence establishment of covertly supporting the Taliban and the Haqqani network of militants to counter archrival India’s growing influence in the war-shattered country. “We had more hopes in (General) Raheel Sharif, but now believe he also plays a game with Afghanistan and never meant what he promised,” the aide to Ghani told VOA, referring to the chief of Pakistan’s powerful military. FILE - This picture released by Pakistan's army shows General Raheel Sharif meeting with Afghan President Ashraf Ghani, Dec. 27, 2015. General Sharif has personally led the effort to try to remove misgivings and improve relations by undertaking several visits to Kabul since Ghani took office. 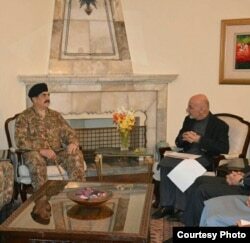 The diplomacy resulted in the first direct meeting between Taliban and Afghan officials Pakistan hosted last July. Bilateral relations have plunged to new lows since last month’s complex Taliban suicide bombing in the Afghan capital that killed nearly 70 people and left hundreds wounded. Kabul blamed Pakistan-based Haqqanis for plotting the violence and called for Islamabad to take military action against the group. Consequently, an outraged Ghani announced he would no longer ask Pakistan to bring fugitive Taliban leaders sheltering on the other side of the border to the negotiating table, although he did not entirely close the door for talks with the Taliban. The Afghan president also demanded Islamabad uproot sanctuaries in its territory the insurgency has been allegedly using for directing attacks in his country. The move effectively ended what analysts saw were the “bright days” of cooperation between Afghanistan and Pakistan for which President Ghani was credited for promoting peace efforts. “Right now, of course, I acknowledge that the relationship between the two countries (is) at a very low. The trust between the two countries is not existent,” Kabul’s ambassador to Islamabad, Hazrat Omar Zakhilwal told VOA. The current instability and insecurity challenges facing the two countries, the ambassador says, “are a direct consequence of the mistrustful environment” in the bilateral ties. Pakistani leaders condemned the Kabul attack and dismissed Ghani’s criticism and allegations that Islamabad has not abandoned its past polices of fomenting trouble in Afghanistan as “remarks made in the heat of the moment." They also insist that Pakistan’s military has conducted operations against all terrorist groups on its soil “without discrimination” to help in the Afghan stability and reconciliation efforts. 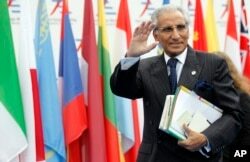 Tariq Fatemi, who assists the Pakistani prime minister on foreign policy matters, says Islamabad’s own “thorough” investigation into the Kabul attack has concluded neither his country was involved nor was there any involvement of Pakistan-based elements. FILE - Pakistan's Special Assistant to Prime Minister on Foreign Affairs Syed Tariq Fatemi. “It was basically an indigenous terrorist action. Pakistan had nothing to do with it. We have conveyed this to them (the Afghan government) and we have made it clear that if there is any evidence available with them that is contrary to this evidence that is available to us then they should share it with us,” Fatemi told state-run Pakistani television in a rare wide-ranging interview late Friday. He said Ghani's criticism and outrage "will not deflect and discourage” Pakistan because Islamabad's commitment "is undoubtedly genuine and 100 percent” in terms of promoting Afghan peace and reconciliation. “We are dealing with the legitimate and the elected government of President Ghani. We have high regards for him and have full confidence in his leadership. We will continue to work closely with him,” Fatemi asserted. He added that Islamabad believes the so-called Quadrilateral Coordination Group (QCG) involving senior Pakistani, Afghan, Chinese and U.S. officials should not give up on efforts to promote the reconciliation process because the only solution to the conflict in Afghanistan is through peace talks. “And we shall remain on this track till such time that the Afghans come and tell as along with the other members of the QCG that this process is redundant and useless,” Fatemi noted. The four-nation group has been making efforts since the beginning of this year to arrange talks between Taliban and Afghan negotiators. An initial round was expected to be hosted by Pakistan in early March, but the insurgent group refused to attend in a last-minute move. To the surprise of Afghan officials, however, a three-member Taliban delegation from its Qatar-based political office visited Islamabad this past week for conversations with Pakistani interlocutors "to explore" possible peace talks with Kabul. No official details were released about the three-member Taliban delegation's engagement that Pakistani and diplomatic sources described as "exploratory contacts." But the move apparently angered the Afghan government, condemning Pakistan for allowing the "terrorist group" to undertake such a visit. It as was an attempt by Pakistani authorities to “deflect attention and ease growing pressure” they were facing after the Kabul attack, the Afghan presidential aide said. “We had already abandoned peace talks through Pakistan, but the visit demonstrated greater control they (Pakistanis) have over the Taliban than we initially thought," the aide asserted. He went on to allege that Islamabad could have pushed the insurgents to the talks in March according to its pledge to QCG, but they have never wanted to do so and wanted the Taliban to go ahead and launch their spring offensive in Afghanistan.